Australian government is recommending that their copyright system is amended to ‘fair use’ rather than ‘fair dealing’ for use of works without the rights holder’s permission. This would mean adding a fair use exception for works, or adding to existing exceptions under fair dealing. The UK introduced revised exceptions to copyright in 2014. 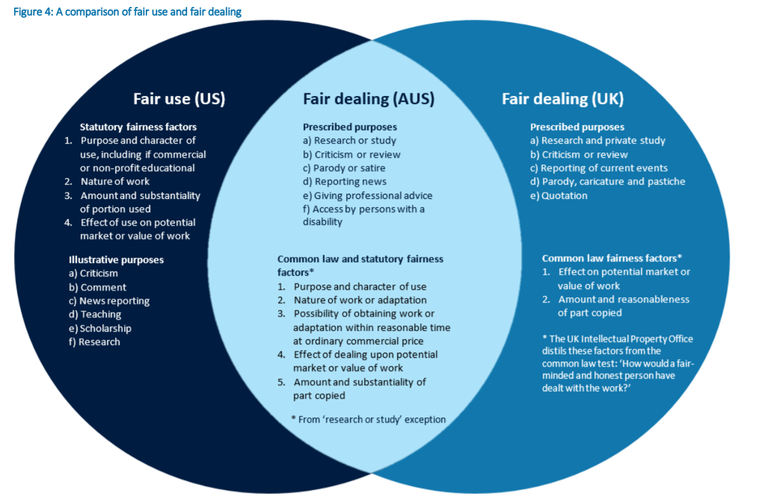 The concerns over this are that while certain copyright exceptions (for example relating to research and private study, criticism or review, or news reporting) only apply if the use of the work is considered ‘fair dealing’, use of works under fair use in the Australian proposal would be a mix of prescribed purposes and ‘fairness factors’ which put forward vague factors such as the “Possibility of obtaining work or adaptation within reasonable time at ordinary commercial price”. This could mean that if someone wanted to use an illustration, and they couldn’t get it in the time frame they wanted at an ‘ordinary commercial price’ (how is this defined? ), then they may be able to use the work under the fair use exception without permission. In our submission we pointed out that concerns over fair use are that it applies in a very broad way and therefore creates a lack of certainty, as interpreting whether the use of a copyrighted work is fair or not is more complex, and consequently detrimental to all businesses in the creative value chain. Orphan works are also part of the consultation, and the BCC recommends in their submission that use of orphan works for commercial use should only be made available under a licensing scheme for commercial use. And that the non-commercial use of orphan works is appropriate for a focused copyright exception for use by these types of organisations: publicly accessible library, educational establishment or museum, an archive, a film or audio heritage institution, or a public service broadcasting organisation. We will update as the Australian copyright modernisation progresses.